One of the HEEKSS Emergency Care Programme strategic priorities is the retention of the urgent and emergency workforce through education, development and training support. 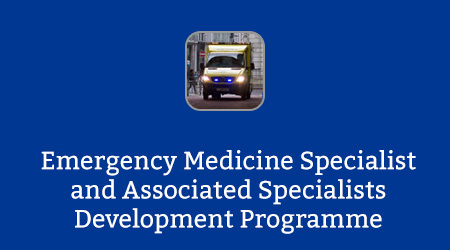 This programme aims to enable non-training middle grade (EM SAS) doctors working in the region’s Emergency Departments to further develop and enhance their clinical and non-clinical skills, allowing them to work more safely as the senior decision maker doctors in their departments and to work effectively without direct supervision, such as on the night rota. One of the most difficult aspects of the present national crisis in Emergency Medicine is that of recruitment and retention, specifically ensuring departments have sufficient numbers of doctors possessing the competencies to fill the night shifts of a 24 hour middle grade rota. HEEKSS has recognised the need to provide training to non-training grade doctors working in the region. In addition to the improved patient safety that this programme aims to achieve, it is also envisaged that there will be enhanced experience for junior trainees working alongside these SAS doctors, as well as promoting Emergency Medicine as a specialty. This programme is specifically aimed at junior EM SAS doctors currently working on middle grade rotas but always under direct senior supervision. The programme focuses on developing clinical skills, understanding how human factors impact practice, learning how to manage the Emergency Department effectively and how to supervise junior trainees, and the development of leadership skills. The programme consists of a combination of face-to-face and e-learning modules, with the aim of these being completed over a four month period. In addition to the actual content of the face-to-face days, these days provide doctors with opportunities to visit other departments and network with other doctors working in similar roles around the region. The e-learning component of the programme consists of a set of 3 structured modules encompassing a variety of traditional and novel platforms with the aim that the online content is worked through independently prior to a facilitated group discussion of the content, allowing the opportunity to question and explore issues raised. The programme aims to introduce and embed concepts of lifelong learning, and as such information will be provided to introduce participants to a variety of learning platforms and concepts in addition to the traditional e-learning such as podcasts, blogs, vlogs and social media interaction such as FOAMed. It is hoped that the addition of some of the newer learning media will ignite, or further develop, a passion for ongoing learning and interaction with peers, with the hope that this will see an increase in recruitment and retention of this vital group of medical workforce. The project team would like to extend their thanks to everyone who is involved in hosting and running the face-to-face and discussion components of the programme. If you already have an account with e-LfH, then you can enrol on to the EM SAS Development programme by logging in to the e-LfH Hub, selecting My Account > Enrolment and selecting the programme. You can then access the programme immediately in the My e-Learning section.